Homemade Soap Recipe - "Shea Butter Coconut Milk"
Sensitive skin rejoice...this homemade soap recipe produces a luxuriously rich, creamy and conditioning bar. 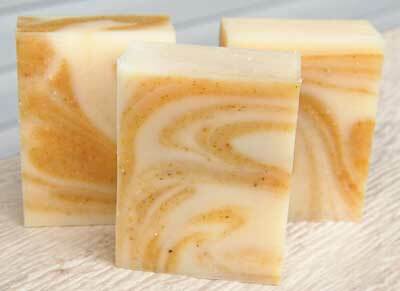 Don't you just love how the swirl of warm yellow calendula makes this bar look so amazing? I've lowered the amount of coconut oil and palm oil and added nutrient rich ingredients like shea butter, coconut milk, olive oil, castor oil and calendula petals to make this a wonderful skin loving bar of soap. If you would like to make this recipe palm free, increase the shea butter to 25% and the olive oil to 45%. Don't forget to run the recipe through the lye calculator to get the correct amount of lye needed to saponify the oil. You can also increase the milk content of this recipe by fortifying the liquid coconut milk with powdered milk to make it stronger. Coconut Milk - 97 gr. | 3.42 oz. Lye - 123.2 gr. | 4.34 oz. Make the shea butter coconut milk homemade soap recipe following the instructions for your preferred soap making method found on the "How to Make Soap" page and incorporate the following steps. Lightly warm your coconut milk and set it aside. It will be added to the soap batter when it reaches a thin trace. Grind the calendula petals and set aside. Bring your soap batter to a thin trace and add in the coconut milk. Continue to stick blend the soap batter until a medium trace is reached and pour 3/4 of the soap batter into your prepared soap mould. To the remaining soap, add the finely ground calendula flower petals and mix well. Pour over the soap base in the mould in a zig zag pattern. While pouring hold the soap bucket up high and down low...this helps send the coloured soap to different depths in the white soap base. Using a spatula or other utensil, swirl the soap into a marble pattern.